Bendy Phones Possibly Coming Out in 2013! It’s technically called flexible display technology, but saying “bendy phones” is so much more fun, isn’t it? I don’t have many complaints about my iPhone, but there is something totally appealing about a phone that can bend, twist, and turn in practically any direction without worrying about it not functioning anymore. Put your phone in your jeans pocket or in your bag, and even if you accidentally sit on it, it should accept a reasonable degree of stress. That’s what bendy phones are all about, and it looks like we might see them in the near future! It’s just a rumour at this point, but the fact is that major players in the mobile phone industry are spending quite some time, effort, and money on research and development on bendy phones. Mobile phone manufacturers such as LG, Philips, Sharp, Sony, Samsung, and Nokia are said to be engaged in the technology, although speculators say that Samsung is the leader in the game at the moment. With their aggressive moves to own the market, it would not be surprising if Samsung indeed gets there first. 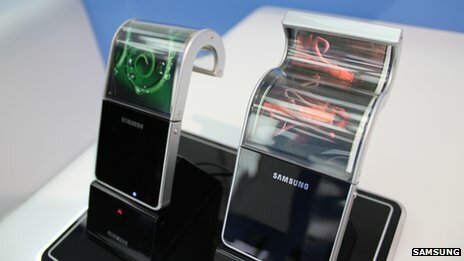 A spokesperson from Samsung has been quoted to say that “their screens will be “foldable, rollable, wearable and more, [and] will allow for a high degree of durability through their use of a plastic substrate that is thinner, lighter and more flexible than… conventional LCD technology”. This was said in reference to phones that make use of OLED (Organic Light Emitting Diode), which is flexible. We’ve seen prototypes and demos during CES, and with everyone wanting to gain an edge over their competitors, it would not be surprising to see the phone manufacturers pull all stops to win this race.